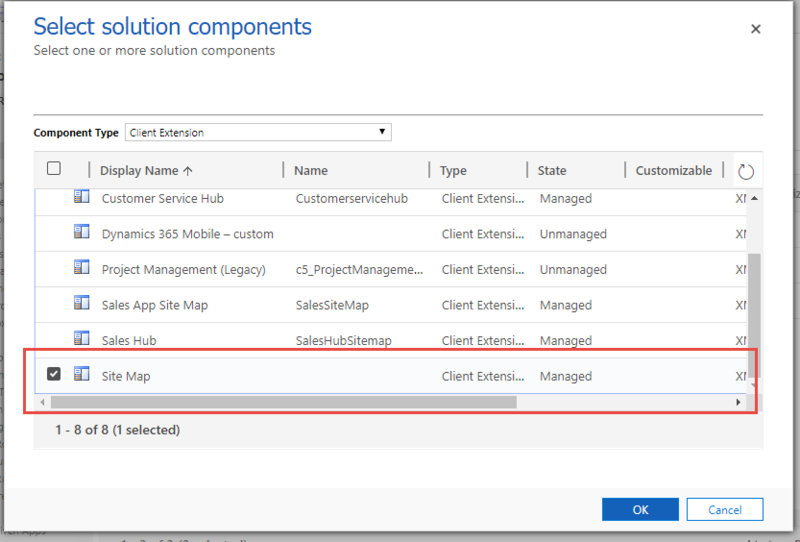 Lately I have had several occasions where deleting or importing a managed solution has removed groups and their subareas from the Microsoft Dynamics 365 Customer Experience (from here on out known as CRM) sitemap. The sitemap is the area at the top of CRM used for navigation. The two groups that seem to be affected are under Settings. The Process Center group, which contains the subarea Processes where workflows, business process flows, dialogs, task flows and actions live. The other group getting the smack down is Applications where the subarea My Apps typically hang out. Aren't Processes Supposed to be Here? I have seen this happen most often when importing the Organizational Insights solution. 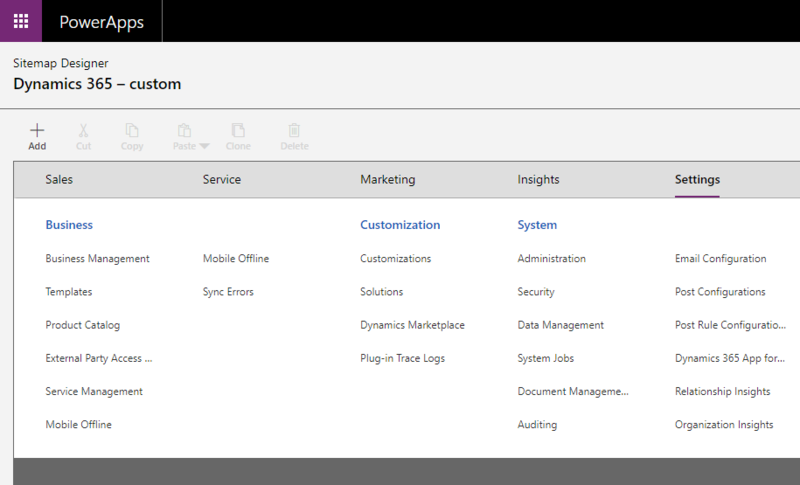 Of course now Organizational Insights is available outside of the application in the Admin Center as a preview so it should not be removing stuff anymore. Now don’t get me wrong, Organizational Insights is is a great tool. It allows you to see metrics on things like adoption, storage, performance and even helps with troubleshoot failing workflows and API calls. We have started using this solution with a couple of our clients and every time I installed it, the Process Center group and Applications group would disappear from under the Settings area. And I did not notice at first. I had one of those "isn't Processes supposed to be here???" moments. Since I did not see the issue right away it took me a bit to figure out what had happened. I simply added the missing groups back. It was not until I had the occasion to install the solution and then go right to Processes that I realized what was happening. Although there are a couple of ways to fix this I recommend using the Sitemap Designer you can access right within CRM. In order to do this you need to create a solution. I always recommend creating solutions when making changes to CRM. Two reasons, first best practices means when changes are made they are first made in a test environment and then moved to production after proper testing. Second, if that is not the way you roll or you only have one environment, solutions are still a good idea because you can use them to track the changes you make. Especially now that you can get granular with them. Not like the olden days when you had to move the whole entity... the horror! So lets number this out. Go to Settings-> Solutions-> Create a solution. Name it a descriptive name, add a short description of what you are changing, save it. Several will be available. Pick the one called Site Map. Export the solution for safe keeping in case there is an issue. I typically do not have an issue, especially with this method but it is good to be on the safe side. Now back in your solution, double click the site map and be whisked away to the Sitemap Designer. Navigate to the Settings and click on it. 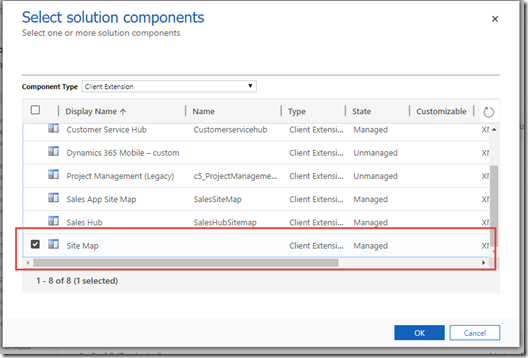 Prev9 CRM will be a tile. Clicking on System brings focus to the groups section of the site map. This way when you click the Add button in the next step, you will have the option to add a Group. Click Add (up a little to the left in the designer). If Group and Subarea are grayed out, go back to step 5 and 6. If you are adding more than one Group, click Group twice. Because you chose System before clicking Add-> Group the new group(s) will be created to the right of the System group, just like when adding columns in advanced find. Click on Group and to the right there will now be a Components and Properties tab with the Properties tab open. When adding back processes where workflows are, for Name, fill in Process Center. When adding back apps, for Name, fill in My Apps. If adding processes… click Process Center so it is highlighted. Now click Add and choose Subarea. The Properties tab will be available again but will look a little more involved. If adding apps, click My Apps so it is highlighted. Now click Add and choose Subarea. The Properties tab will be available again but look a little more involved. Save and Publish. Refresh your browser and the Process Center and My Apps should have returned. If other things disappear you can use this same process to add them back. Now of course you could solve this by moving the sitemap from another environment but then whatever you imported would not be there so you would have to add that back. If that is the way you go, Add your sitemap to a solution and gather the information you need to add back the stuff that will be missing when you import a sitemap from another org. Need a team to help you work through scenarios just like this one? Contact us for more information about ongoing support! So hopefully these step will help you get back what was lost. Enjoy! And I hope you are having a lovely day wherever you are. « Project Managers Rejoice! 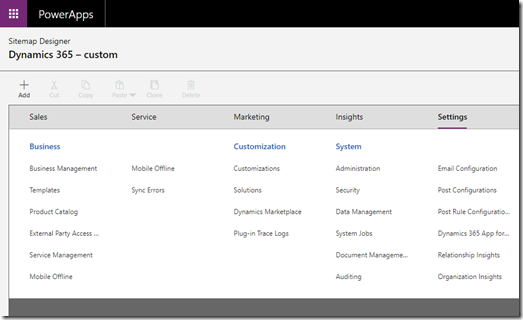 You Can Create Multiple Plans for a Single Office 365 Group!